BTC – We deserve better. The armed service members in this country deserve better. However- the sad truth is that Pvt. Bradley Manning is experiencing the US institution of torture and rendition consistent with being classified as a “terrorist”. This is what the United States military has been reduced to: extorting us towards crushing debt to pay for torture and incarceration of our own citizens when THEY TELL THE TRUTH. Be reminded, we may demand a different standard than, “shut up, lay down and take it without making any noise”. Daniel Ellsberg, a pioneer in the art of the leak led a revolution in public awareness. This was before news organizations were infiltrated by cold war era military plants. It’s all we can do to to just stay dedicated to blowing the whistle; until The People come down like rain on the worst form of governance in our name in US history. Without further ado, Mr. Daniel Ellsberg, says it again. Try to stay sane. DO SOMETHING! Have you heard that one of President Bush’s torture advisors is now a federal judge in California? In August 2002, Judge Jay Bybee wrote a horrific memo enabling the torture of detainees — including waterboarding — at Guantanamo Bay. In 2003, he was confirmed to a seat on the important Ninth Circuit Federal Court of Appeals in San Francisco. Instead of sitting on the federal bench, he must be held accountable for his role in the unspeakable crimes that took place at Guantanamo Bay under President Bush. 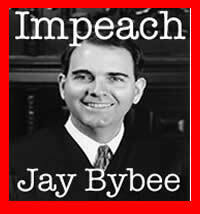 The Courage Campaign is helping a diverse group of California progressive activists who are working to pass a resolution at this Friday’s California Democratic Party convention demanding that the U.S. House of Representatives begin impeachment proceedings against Judge Jay Bybee. This resolution is the first step in holding Judge Bybee accountable for what he has done.